KVeCS Grand Finale was finally held on January 19th, 2018. The KVeCS is an abbreviation for Keihanna Venture Championship, which is a series of pitch contests monthly held from July 2017 by Keihanna Research complex. The 11 companies who won the KVeCS challenged the battle for the chance to attend the special program offered by Entrepreneurs Roundtable Accelerator (abbr. ERA), one of the largest accelerators in NYC, and to pitch to the US investors. KVeCS Grand Finale was finally held on January 19th, 2018. 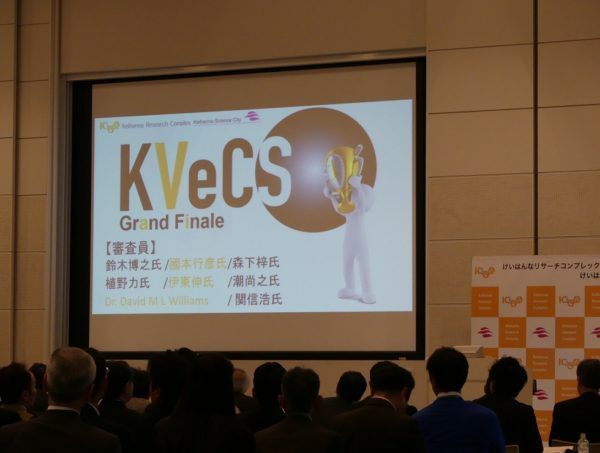 The KVeCS is an abbreviation for Keihanna Venture Championship, which is a series of pitch contests monthly held from July 2017 by Keihanna Research complex. The 11 companies who won the KVeCS challenged the battle for the chance to attend the special program offered by Entrepreneurs Roundtable Accelerator (abbr. ERA), one of the largest accelerators in NYC, and to pitch to the US investors. The KVeCS started with a keynote lecture “The only thing to challenge the US market” by Mr.Nobuhiro Seki, who had considerable experience and achievements in the US and also was the founder of FabFoundry. Later, Mr. Murat Aktihanoglu, the co-founder and managing partner of ERA, gave a message through video shot at the office located among skyscrapers of NYC. The atmosphere in the room gradually changed into the mood for pitch. 8 judges were introduced in English and got seated. “Are you ready?” The MC asked the challengers. Yes, they needed to pitch in English on that day. The first presenter was Magellan Systems Japan, Inc. The presenter looked a little tense, and so do the audience. They silently watched the 5-minute pitch and Q & A session in English. 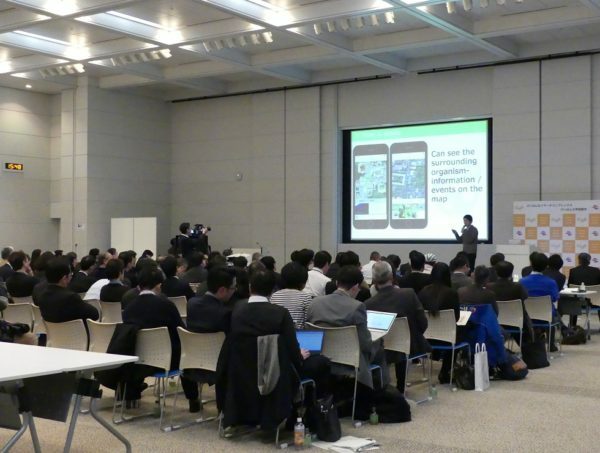 Next came Mitsufuji Corporation, MU Ltd., Chinougijutsu Co., Ltd. , and Pascific wave Co., Ltd.. After a short break, METABIRDS Co., Ltd., PIJIN Co., Ltd. ,Panoramania Inc., Biome Inc., Keigan Inc., and amirobo tech.Inc. made presentations. The most impressive thing is that the audience seriously watched their pitches till the end. With a big applause the pitch time was closed and the judges went to another room to decide which start-ups they should send to NYC as the representatives of Keihanna RC, judging from English ability, presentation skill, and the possibility of launching business overseas, and etc. The time came for the announcement of result, but no one showed up. “Aren’t they ready yet?”, “I will push them”, the staff hastily shuttled between the event room and judge’s room. 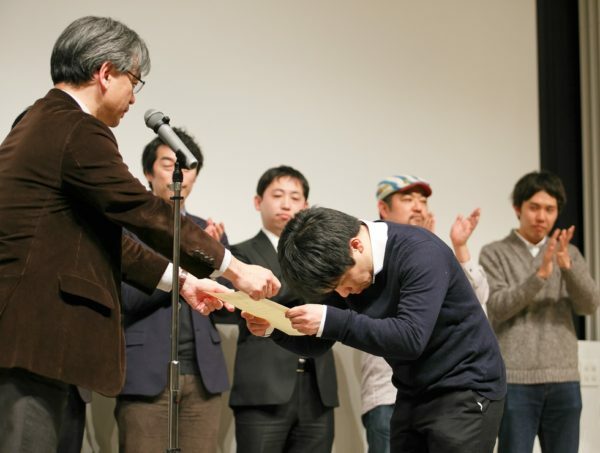 After that, the announcement of winners and the award ceremony began at last. In front of the challengers standing on the stage with a sense of accomplishment, the grand champion’s name was called out, “Keigan Inc.”. Pascific wave Co., Ltd., the runner-up of the KVeCS grand finale, was also called. 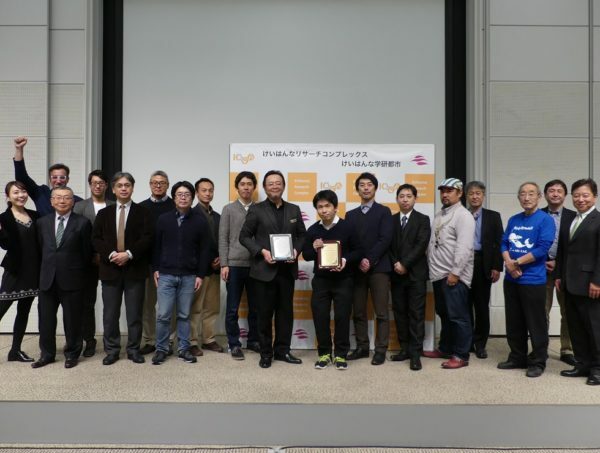 In the applause and cheers, Mr. Tokuda, the representative of Keigan received the commemorative shield with the little trembling hands, which indicated how hard it was to win the 6-month preliminary contests, to improve the pitch in the mentoring program, and to conquer the grand finale championship. KVeCS was the first pitch tournament for Keihanna RC with its slogan “Why not challenge the KVeCS to challenge the world”. We organized and managed the event through repeated trial and error. At first we heard the comment “I cannot understand what this event is”, but after the KVeCS grand finale we could receive some positive comments such as “It is awesome to have such a unique event in Keihanna”. Keihanna RC will continue to take on challenges in the future.